“Soda bread,” I answered, smiling because it hadn’t been in the oven long enough to smell like anything other than the flour which had begun to brown on the baking sheet. “Oh, yah. It is about that time of the year, isn’t it?” he finished, eyes never leaving the television, his Sony perched in his lap, fingers busy filling in the bracket slots for the tournament. Ahh…March Madness. Yes, even I fill out one of those brackets hoping from one year to the next that pure luck will outsmart basketball brilliance and that I will walk away with the pot of gold at the end of the rainbow. I didn’t grow up eating soda bread but probably should have since it doesn’t require much beyond flour, milk, and baking soda and would have fit right into our meals. Definitely simple fare. Although I can remember my mother’s corned beef and cabbage, I’m not all together sure we had it for St. Patrick’s Day dinner — but must have because from my own experience it’s not often that I see it at the grocery store at any other point in the year. No, I started the St. Patrick’s Day dinner when we lived at our old house, not too far from my husband’s parents who would come to enjoy it with us. Even though our idea of a corned beef dinner isn’t Irish at all, that’s what we’d have — with soda bread. 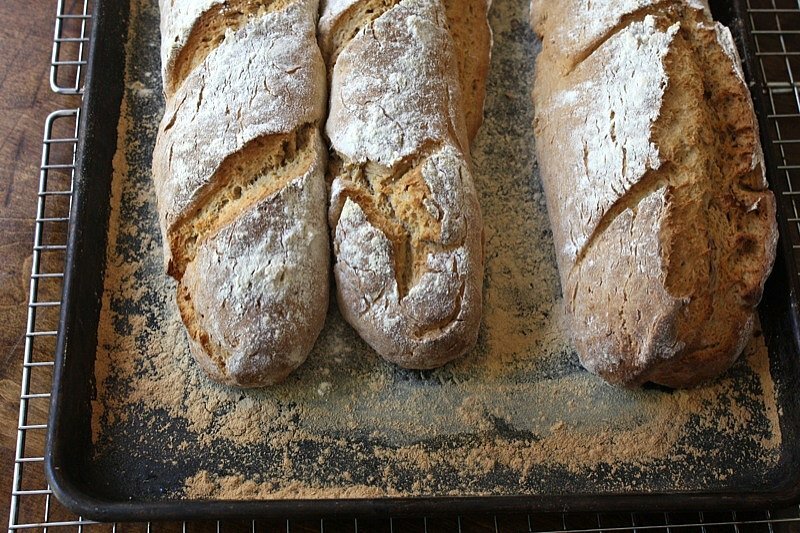 Many of the soda bread recipes I’ve tried are anything but light and fluffy. The dough can be fairly sticky and wet and sometimes it never quite got done in the middle as it baked. The bite of baking soda could be noticed in each bite. Not very appetizing. But I think I’ve found the perfect recipe. Preheat the oven to 425ºF and position a rack in the middle. 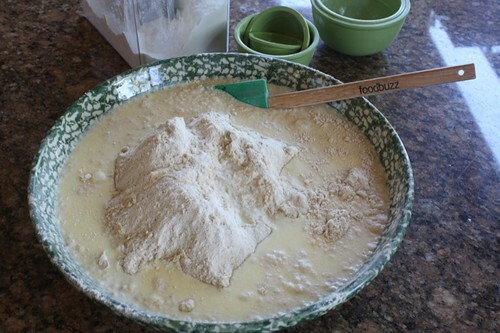 Whisk together to blend well flours, brown sugar, baking soda, and salt in a large wide bowl. Dice the butter and use your fingers to incorporate the butter into the flour mixture until it resembles coarse meal. Whisk the eggs into the buttermilk until well mixed and add the liquid to the flour mixture. With a spatula, mix until a smooth dough forms. 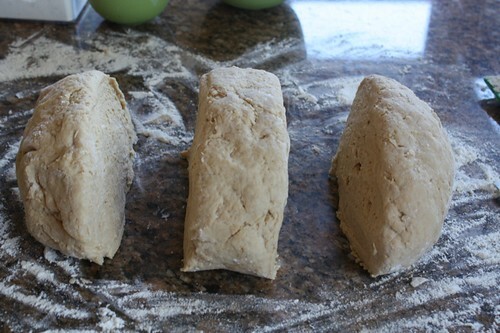 Turn the dough out on to a lightly floured surface and cut into 3 equal pieces. Form each piece into a rope about 16-inches long and place on a lightly floured baking sheet. Generously sprinkle with flour and cut 3 diagonal shallow slashes on each log with a very sharp knife. Bake 30 minutes, then reduce oven to 375ºF and continue to bake until a wooden pick or skewer inserted into center of a loaf comes out clean, about 20 minutes. Transfer loaves to a rack to cool. Serve slightly warm or at room temperature. Soda bread is best the day it is made, but loaves can be tightly wrapped in 2 layers of foil and frozen 1 month. Refresh, wrapped in foil, in a 325ºF oven until heated through, about 20 minutes. This recipe was featured in Gourmet’s March issue. 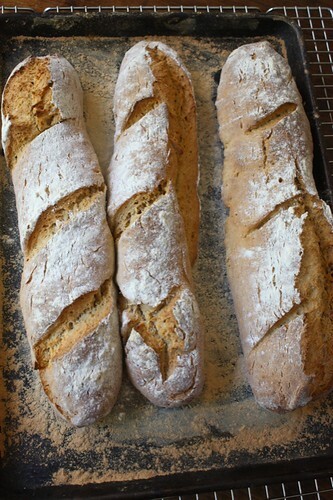 I used King Arthur white whole wheat flour instead of the stone ground flour. When I cook with buttermilk, I never seem to use it all, so have to freeze the remainder. I used frozen then thawed and well shaken buttermilk in this recipe left at room temperature for about an hour. The butter wasn’t chilled, but was far from soft. I find that “pinching” the relatively firm butter pieces into the flour mixture is a pleasant process and the result is butter well-distributed throughout the batter. It should resemble brown sugar in texture. If your hands are lightly dusted with flour, it’s easier to handle this dough after it’s turned out of the bowl. Normally, I’ve made soda bread in rounds. 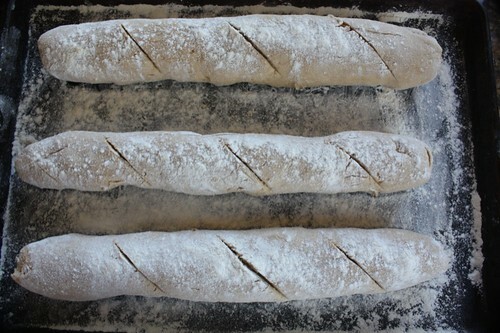 The baguette shape called for in this recipe was interesting because I couldn’t quite get those crevices out of the dough in my ropes and didn’t want to keep handling it so left them to see what would happen. Test the bread for doneness in more than one place each time using a different skewer. One of my loaves wasn’t quite finished and I put it back in the oven with the heat off just to sit for 5 minutes. Clearly, I needed to approach my slashes differently. The expansion caused my loaves to burst. 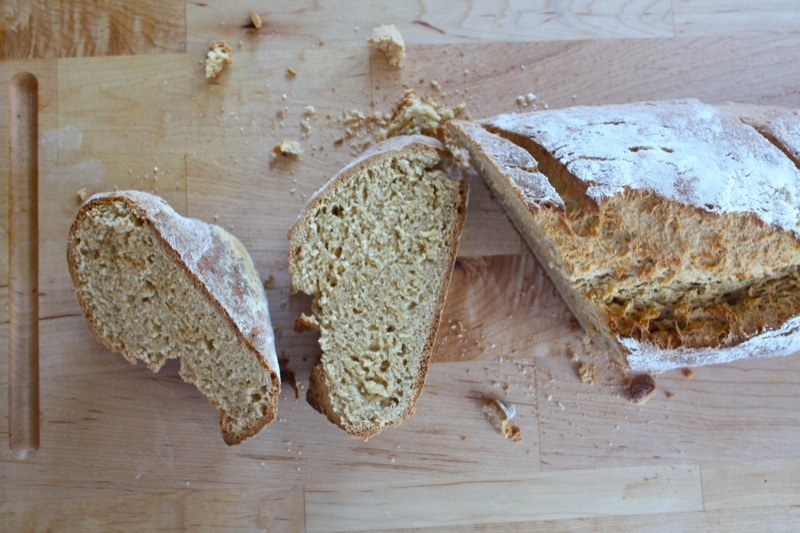 I’m thinking it just adds to the rustic appeal of this bread which is much more light than I’m used to, easy to slice, and completely without that soda taste. 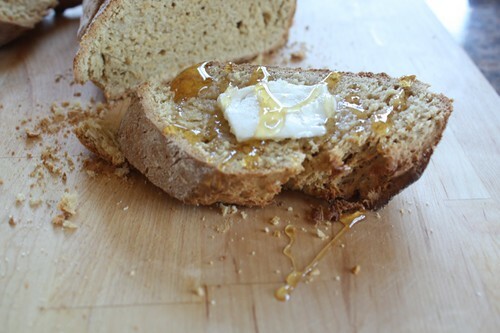 Warm from the oven with butter and honey is very, very nice.